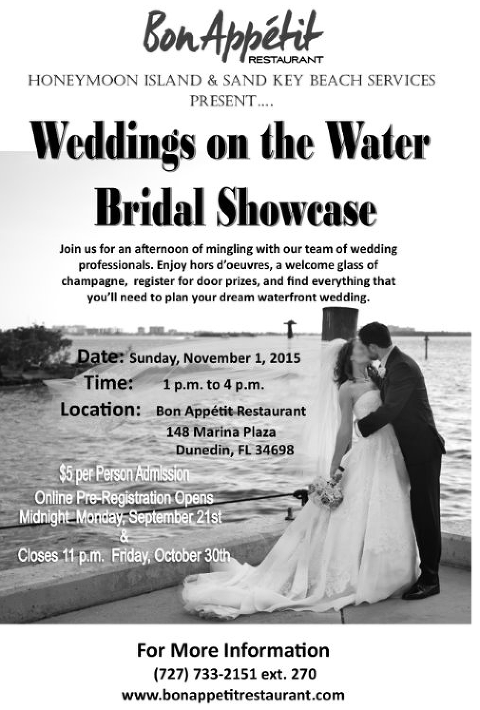 Voted “Tampa’s best waterfront restaurant,” Bon Appetit Restaurant in Dunedin will be hosting their Weddings on the Water Bridal Showcase on Sunday, November 1, 2015 from 1-4 p.m. Sip champagne and mingle with 20 talented Clearwater wedding vendors. Special door prizes will be awarded for registered guests (includes non-brides as well). Complimentary hors d’oeuvres will be provided by Bon Appetit.